You probably thought that the citrus madness ended with my last lemon post. Hah! While it was the last post on lemons, other citrus fruits have found their way to my door, with heartfelt pleas to "take all you want!" and "please take more!" Last weekend, our friend Ruth stopped by between errands with armloads of sweet, juicy grapefruit, and two bags of kumquats - I can't even begin to tell you how many of those little golden fruits were there. It would be like guessing how many jelly beans are in a jar at the county fair. We accepted half a dozen grapefruit for Mark, who has a special fondness for them. After tasting the two very different varieties of kumquats, I greedily snatched one bag and starting scheming. I chose the sweeter of the two types, as I like to eat them whole, but also felt they would be great for a chutney I have been making these past years. 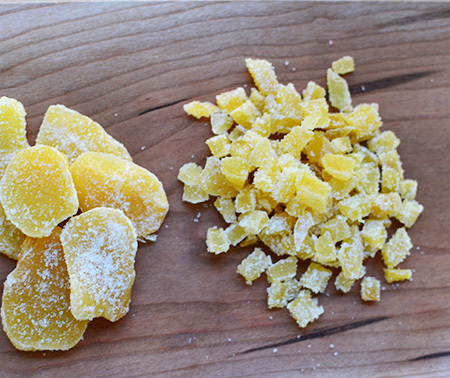 If you have leftover fruits, sweet kumquat slices make a beautiful cake garnish, and add a pleasant zing to salads. A couple of years ago, I candied them with rosemary. Of course, we simply eat them out-of-hand too, skin and all. 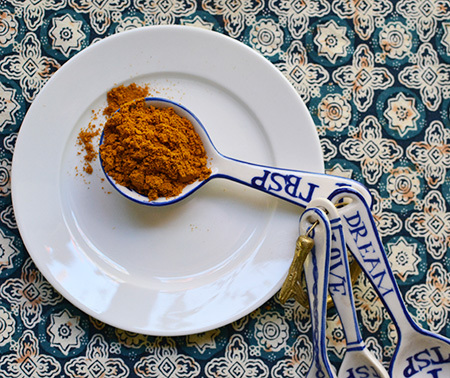 Tell me: how do you use kumquats? 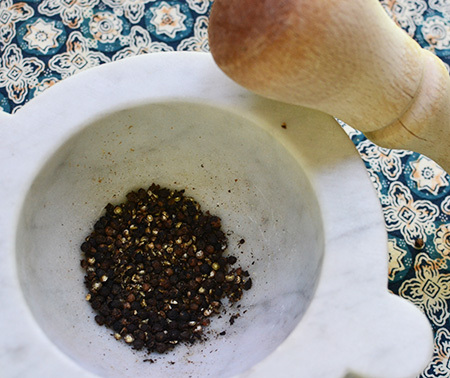 Bring sugar, vinegar, ginger, curry, cracked black pepper and kumquats to a boil in a large heavy-bottomed kettle over medium-high heat. Cook until thickened and darkened, about 10-12 minutes. Add cilantro, and boil for another minute. Divide chutney among sterilized canning jars. Cover and seal in a hot water bath for 10 minutes. Serve on a charcuterie board of crackers, breads, cheeses, and cured meats, or with simple grilled chicken or pork. 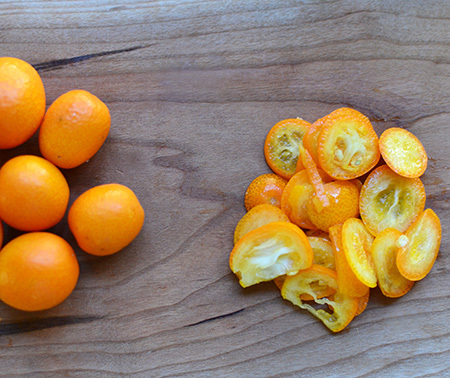 Here is how to slice a kumquat! If you cannot see the video clip here, please click HERE. I love kumquats and will make your chutney. It looks great. Somewhere in my recipe file I have a chocolate cake with kumquat sauce . Yum! I don't actually know if I've ever had a kumquat! I know, I know, it's sacrilege, considering I lived in Tucson with kumquat trees right on campus. They're so cute! They grow so well here, Caroline! We have a tiny tree in a pot that gives us just enough for one small jar of this chutney. Its a good thing we have friends with BIG trees! Dear David, how lucky you are. For some reason - might be a weather thing - I neither have citrus trees in my graden nor do I have friends that decide to share an abundance of fruits with me. And at this time of year, kumquats are not to be found anywhere around here. You are a lucky one indeed! Euch beiden ein schönes und sonniges Wochenende - it feels light fall around here, it is so cold and windy and it even snowed. Andrea - how odd that you are getting such cold weather! I hope some good May sunshine finds you soon! Yes, we are very lucky that we have friends who share their citrus - and lucky we live in a place where it is nice and warm for growing it. As I just mentioned to Caroline, we have a tiny tree that gives us about a cup of kumquats at a time. Just enough to make a small batch. Yours will get there, Greg! Oh, how divine! Kumquats are such a rare thing here. Liz - I would have thought they would be abundant, as you are much closer to the original source than we are! I've got to be honest, I've never cooked with kumquats. We don't actually see them much. Something tells me the next time I see them at the grocers or market, I'll be turning them into this chutney. Seeing that you're Mr Citrus and all, have you ever tried pomelo? I adore it, especially the pink variety. We were first introduced many many years ago in Vietnam, bought from a kid on the roadside. When they're in season here in Oz, we almost always have one in the fridge. John - yes, we see pomelos here in our farmers markets, and in the grocery stores. But their relation to grapefruit makes it impossible for me to eat them - I have one of those blasted statins that I am taking! Thanks, Marcelle - I imagine they are pretty easily found in Texas? They are definitely worth trying! I have never know what to do with them or how to eat them. I have seen them in the store, but nobody seems to buy them either. How about some more ideas for neophytes like me? Cathy - in the article today, I mention a couple of good ways to use them - sliced in salads, or sliced as cake decorations. They are also just good to eat as is - skin and all. And I see there is a new comment below that mentions a pistachio and kumquat appetizer. Hmmmm... I think I want that! Very cleaver video which must work well for the chutney. I have a recipe created by friend, now deceased, who would probably love to know that her kumquat-pistachio appetizer was being shared with other foodies. I promise to track it down and send it to you! Sounds really nice. 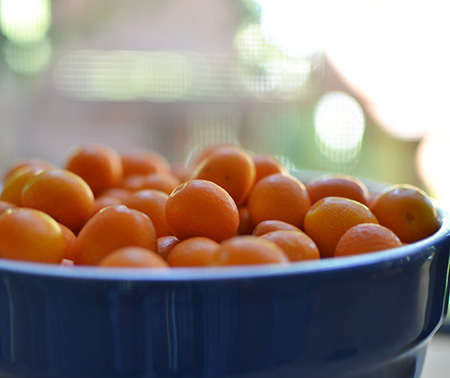 Kumquats have a tartness not everyone enjoys, but I do—I even like eating them raw. But for those who don't I can see how a relish with plenty of sugar would be an ideal way to balance out their assertive flavor. Frank - since moving to the desert, we have discovered many varieties of kumquats - from the truly tart, to those that are very sweet. Like you, we like them all! Are you making me jealous intentionally?? I would do anything for citrus! Last year when the new Whole Foods opened by my house, they had a boat load of citrus and in particular all these kumquats, and limequats, lemonquats, mandarinquats...I can't tell you how many varieties of mini citrus. I asked the produce guy what they all tasted like and he told me hadn't tried them yet but we could do it together. We tasted every single one. That was pretty cool. They were all so different but still had that distinct citrus taste with various sweetness and tartness. They were wonderful. This year didn't see the huge variety. I must've been the only one who bought them! Love this chutney! I can see it going really well with some curried chicken puffs...delicious! Oh, I am so glad you have had a mandarinquat, Nazneen! I absolutely LOVE them! How fun that you got to taste them all! And, no, I am not trying to make you jealous - just trying to use everything everybody gives me! 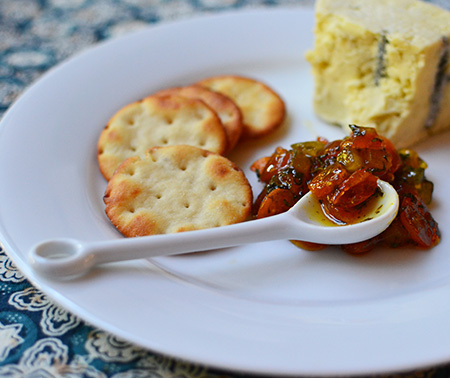 :) You will love this chutney! We just had yet another friend offer us a tree's worth of kumquats. Wish you liked here, Ahu - we would share them with you! You will love this chutney - we actually had it on a fruit, meat and cheese board on Saturday night! Funny, just a couple days ago I found kumquats in a local chain supermarket. I showed them to my husband and then he reminded me of a line from a W.C. Fields movie we had seen on TCM a while back in which he plays a grocer. One customer kept bothering him and finally said, "Now will you get me my kumquats?" We thought that was hilarious and often say it to each other. We like being goofy. What a fun comment, Caterina - and being goofy is perfect! (So are we!) I am going to have to try and find that movie - I have never seen a WC Fields film! I would much rather count kumquats than jelly bellies! ;-) Seriously, this looks so divine -- I'd put it on everything! Among other things, I want it on a grilled chicken burger. Yum! Hmmmm... now I want a chicken burger, Valentina! And it is only 6:00am! 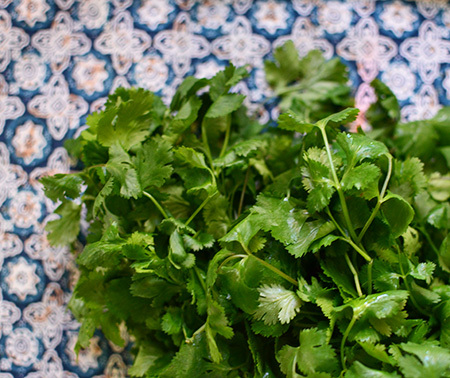 David, What could I substitute for the cilantro?? I am still drowning in kumquats. I made a huge batch of marmalade, but still have more fruit! I think I would go for rosemary, Ruth. In fact, I think my next batch will be made with rosemary. Thanks so much for all the beautiful kumquats and grapefruits! LOVE them! Hi David, I don't really have much experience with kumquats, so I can't really tell you how I use them. Love what you did though sounds amazing. Was in Tucson Sunday and Monday, ate at the Cup Monday morning, cool place. Take care! I love the Cup, Cheri - one of these visits, you and I have to meet! I am surprised that you don't use kumquats, as they are even more prevalent in Phoenix than here! I absolutely adore kumquats, especially in syrup! I have friends with kumquat trees and after a while they just give away huge bags since there are so many of them. Of course I'm always there with my arms extended, jaja! This chutney sounds perfect. Really great recipe David!